Younan Properties, Inc., a full-service, national real estate owner and property manager of Class A office buildings in Dallas, Houston, Los Angeles, Chicago and Phoenix, announced that it successfully completed the refinance of Younan Tower in Houston. The new five-year, fixed rate loan funded on September 6 by lender ReadyCap Commercial, LLC, of Irvine, CA. 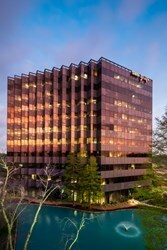 Younan Tower is a 10-story, Class A office property with 165,094 square feet, strategically located in the Northbelt submarket and has served as corporate headquarters for several Fortune 500 companies. The distinctive exterior is comprised of high-performance, tinted glass panels and landscaped outdoor amenities for tenants include an abundance of green space and a fully-stocked Koi pond. The lobby features granite and marble flooring and walls. The building offers a seven-level parking garage, abundant surface parking, full service cafe, 24/7 security and after-hours card key access. Younan Properties, Inc., is a privately held real estate investment and management company, specializing in acquiring and managing Class A office properties in strong growth markets throughout the United States including Dallas, Houston, Chicago, Los Angeles and Phoenix. Known for its detailed, hands-on approach to improving operational efficiencies while maintaining top building standards for tenants, Younan’s current portfolio consists of 19 office properties in five top metro markets. Younan’s fully-integrated real estate investment company offers in-house expertise and resources in leasing, asset and property management, marketing, acquisitions, redevelopment, facility engineering and financing. For more information, visit http://www.younanproperties.com. Written by: Sushil Kumar on September 29, 2013.